Use the Establish and Validate requests to instantly validate consumer, retrieve customer's bank account information and optional service to retrieve additional customer information (name, address, email and phone). This call would be performed prior to the enrollment request offered by the Consumer Profile Management service. In order to complete integration with the Online Bank Login service's Establish and Validate requests, please refer to the ACH integration guides. This is used to identify the app. Please be aware that HMAC Signature is valid upto 5 min for Authorization purpose. Construct the data param by appending the parameters below in the same order as shown. a. apikey - API key of the developer. b. nonce - secure random number. c. timestamp - epoch timestamp in milliseconds. d. token - Merchant Token. e. payload - Actual body content passed as post request. Calculate the base64 of the hash which would be our required Authorization header value. // The conversion (NSData to HexString) shown below is just an example. Please use other appropriate methods to do the conversion. apiKey = "<your api key>"
apiSecret = "<your consumer secret>"
payload = "<For POST - Request body / For GET - empty string>"
This is the place where request body description lies. This is the place where response body description lies. This is the place where API Error Codes. Expiry Date: Any future date. Making OnlineBankLogin API requests requires you to grant access to this app. You will be directed to OnlineBankLogin to approve the use of your credentials and then returned to this page. Payeezy gateway Response code indicates the status of a transaction as it is sent to the financial institution and returned to the client. Ex: The Response Code "00" (Transaction Normal) indicates that the transaction was processed normally. Any response other than "00" indicates that it was not normal. This response code indicates that the transaction was processed normally. Please refer to the bank and approval response information for bank approval Status. The following response codes indicate invalid data in the transaction. In these cases, the data should be changed before attempting to resend the transaction. These response codes are generated by the remote Plug-In. The following response codes indicate a problem with the merchant configuration at the financial institution. Please contact Payeezy for further investigation. The following response codes indicate a problem with the Global Gateway e4℠ host or an error in the merchant configuration. Please contact Payeezy for further investigation. The following response codes indicate the final state of a transaction. In the event of one of these codes being returned, please contact Payeezy for further investigation. The following response codes indicate the final state of a transaction due to custom Fraud Filters created by the Merchant. -5003 The order already exists in the database. 10486 This transaction couldn't be completed. Please redirect your customer to PayPal. -5994 The selected brand does not match the card number. 10422 The customer must return to PayPal to select new funding sources. -10601 Total amount passed is more than the Return/Void amount. None Transaction rejected, please contact the buyer. The following response codes indicate a problem with Payeezy℠ Gateway or an error in the merchant configuration. Please contact Payeezy for further investigation. “transaction tag” parameter is based on a PayPal Primary Order, Authorize or Purchase Transaction. “transaction tag” parameter is based on a PayPal Order, Capture, or Purchase Transaction. This is the Transarmor Token. This value can be obtained from the Payeezy gateway merchant portal as shown below.Note: This is required for US merchants only. Step 2: Navigate to Terminals tab and Select your terminal. 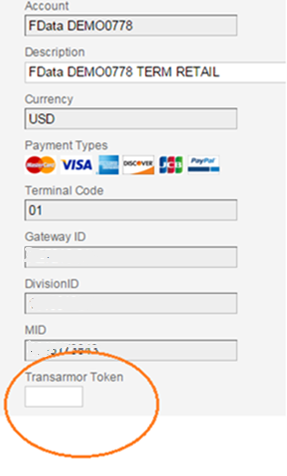 Step 3: As shown below, retrieve the transarmor token value. This is your ta_token parameter. For SANDBOX (CERT) test merchant account, please set ta_token=123. For LIVE merchant account, capture tatoken value as shown below. Please Note: “transaction tag” parameter is based on a ValueLink Primary Purchase Transaction. Before submitting Paypal transactions (ORDER, AUTHORIZE, PURCHASE) to Payeezy, merchant has to obtain Paypal business account and obtain API credentials (user name, password and signature). "Click here" for obtaining the credentials. Merchant needs to provide his Paypal API user, password and signature to be registered with his E4 terminal. The image below shows the same. Merchant has to integrate with Paypal Express Checkout API. "Click here" for details. Note: Note: The way Paypal works is that manual approval of transaction has to be done by customer in the Paypal GUI before you could process that transaction with Payeezy. The image below shows the same. The following CVV2 response Codes may be generated by First Data to indicate the status of a transaction based on your processing parameters. M CVV2/CVC2 Match - Indicates that the card is authentic. Complete the transaction if the authorization request was approved. N CVV2 / CVC2 No Match – May indicate a problem with the card. Contact the cardholder to verify the CVV2 code before completing the transaction, even if the authorization request was approved. P Not Processed - Indicates that the expiration date was not provided with the request, or that the card does not have a valid CVV2 code. If the expiration date was not included with the request, resubmit the request with the expiration date. S Merchant Has Indicated that CVV2 / CVC2 is not present on card - May indicate a problem with the card. Contact the cardholder to verify the CVV2 code before completing the transaction. The AVS result is a one-character response that indicates the degree of match for the provided address. Currently supported AVS responses are below. For merchants who have turned on AVS check, would require to provide "billing_address" object in the request payload. Below is the object format with all the required and optional fields. (optional) object This optional customer billing address object is used for AVS (Address Verification System) check purpose. (optional) string Standard US address format - "Number, Street Name"
(optional) string Nearest city/town/village to the street name provided. (optional) string 2-letter country code. (optional) string customer email address. (optional) object This JSON object holds phone contact details of the customer. (optional) string Type is required when the PhoneNumber field is populated in a transaction request. Otherwise, it is optional. (optional) object Customer phone number field is required is phone object is populated. Phone number length is restricted to 14 and non digits will be removed before processing. A descriptor is a piece of identifying information about a merchant, e.g. business name, phone number, city and/or state, which appears on buyers’ credit/debit card statements. These descriptors remind cardholders of the details of the purchase and give them a way to contact the merchant. The standard descriptor information that gets passed through to the cardholder’s statement is the DBA name and customer service phone number that you provide with your merchant account application. While it is the card issuer’s discretion as to how many characters will show up in each field, if you keep the DBA Name field to fewer than 22 characters and the city field to fewer than 11 characters they should all show up on the cardholder’s statement. Visa requires MOTO merchants to put a phone number in the City field. Ecommerce merchants may use the City field for a URL, email address or phone number. There are additional fields that can be used; however, the majority of those will not appear on a statement. In this example, ABCMovies.com and Caddyshack are entered in the DBA Name field.Phone numbers should always be entered with numeric characters only. (optional) object JSON object that holds the soft descriptor fields that would be required if this object is populated. (optional) string Business name, required Character Format is ASCII. (optional) string Enter your Merchant Category Code. (optional) string 2 digit country code. (optional) string Merchant contact information. Level 2 data fields such as Freight, Duty, etc. - values are for informational purposes only and are not directly reflected in the Total Amount field for the transaction when processed. It is up to the Merchant to ensure that the Total Amount of the transaction reflects the desired Level 2 and 3 amounts. (optional) object JSON object that holds the level2 transaction fields that would be required if this object is populated. (optional) number Tax value included in total amount, only applicable to merchants passing level 2 (Corporate Credit Card - Level II) data. For Canadian merchants this field is the PST amount. (optional) string Registered number associated with the tax value. Used for reference or government claims purposes and only applicable to merchants passing level 2 (Corporate Credit Card - Level II) data. For Canadian merchants this field is the GST amount. For Canadian merchants this field is the GST number. The following properties are used to populate additional information about the transaction, including shipping details and line item information. (optional) object JSON object that holds the level3 transaction fields that would be required if this object is populated. (optional) string Total amount of alternate tax associated with this transaction. (optional) string Tax ID number for the alternate tax associated with this transaction. (optional) number Total charges for any import and/or export duties included in this transaction. (optional) number Total freight or shipping and handling charges. (optional) string The zip/postal code of the location from which the goods were shipped. (optional) object Shipping address associated with the transaction. (optional) string The City of the “ship to” location. (optional) string The State of the “ship to” location. (optional) string The Zip/postal code of the “ship to” location. (optional) string The ISO-assigned code of the country to which the goods were shipped. (optional) string The Accountholder’s name associated with the transaction. (optional) string The Accountholder’s email address associated with the transaction. (optional) string The Accountholder’s phone number associated with the transaction. (optional) string The Street Address of the “ship to” location. (optional) string Purchase order or other number used by merchant’s customer to track the order. (optional) string The commodity code used to classify the item purchased. For a complete list of Commodity Codes "click here"
(optional) number The discounted amount for the line item. (optional) string Indicator for whether a discount is present on the item or not. (optional) string Indicates whether tax is included in the total amount or not. (optional) number The amount of the item. Normally calculated as price multiplied by quantity. (optional) string The UPC product code for the line item. (optional) number Tax amount in dollars and cents. (optional) string Type of tax being applied. (optional) number The per unit cost of the line item. Below is a table of ISO-assigned country codes. When processing Level III transactions, use Alpha-2 values to popluate the Country property in the Line Item Detail. Use these values to populate the TaxType property in Level III Line Item Detail. Use these values to populate the UnitOfMeasure property tag when processing Level III data. The asterisk (*) after the unit name indicates recommended units of measurement that are either an SI (International System of Units) unit, or its multiple or a non-SI unit that may be used together with the SI units and their multiples. The following list reflects all currently defined Payeezy bank response reason codes. Many of these codes will never be returned in your output. For the most common codes returned by Payeezy , the list includes an action field that suggests the best probable course of action to take based on the code returned. If you are receiving codes not listed here, please contact your Account Manager. The following KEY describes the Column Headings and the values appearing in the columns. R 202 Bad Amount Nonnumeric Amount If Amount sent was zero, unreadable, over ceiling limit, or exceeds maximum allowable amount. R 205 Bad Total Auth Amount Fix The sum of the authorization amount from extended data information does not equal detail record authorization Amount. Amount sent was zero, unreadable, over ceiling limit, or exceeds Maximum allowable amount. R 244 Invalid Encryption Format Fix Invalid encryption flag. Data is Inaccurate. R 245 Missing or Invalid Secure Payment Data Fix Visa or MasterCard authentication data not in appropriate Base 64 encoding format or data provided on A non‐e‐Commerce transaction. R 246 Merchant not MasterCard Secure code Enabled Call Division does not participate in MasterCard Secure Code. Contact your First Data Representative for information on getting setup for MasterCard SecureCode. R 251 Invalid Start Date Fix Incorrect start date or card may require an issue number, but a start date was submitted. R 252 Invalid Issue Number Fix Issue number invalid for this BIN. Division does not participate in Soft Merchant Descriptor. Contact your First Data Representative for information on getting set up for Soft Merchant Descriptor. R 263 Partial Authorization Not Allowed or Partial Authorization Request Note Valid Fix Action code or division does not allow partial authorizations or partial authorization request is not valid. R 264 Duplicate Deposit Transaction N/A Transaction is a duplicate of a previously deposited transaction. Transaction will not be processed. The requested transaction type is blocked from being used with this card. Note: This may be the result of either an association rule, or a merchant boarding option. R 351 TransArmor Service Unavailable Resend TransArmor Service temporarily unavailable. D 352 Expired Lock Cust. ValueLink - Lock on funds has expired. R 353 TransArmor Invalid Token or PAN Fix TransArmor Service encountered a problem converting the given Token or PAN with the given Token Type. R 354 TransArmor Invalid Result Cust TransArmor Service encountered a problem with the resulting Token/PAN. D 570 Stop payment order one time recurring/ installment Fix Cardholder has requested this one recurring/installment payment be stopped. Unable to validate the debit. R/D 751 Transit Routing Number Unknown Fix Transit routing number not on list of current acceptable numbers. D 902 Process Unavailable Resend/ Call/ Cust. System error/malfunction with Issuer For Debit – The link is down or setup issue; contact your First Data Representative. D 997 Acquirer Error Call Acquiring bank configuration problem. Contact your First Data representative. The following Auth Code responses may be generated by First Data to indicate the status of an authorized transaction based on your processing parameters.